Expensive, but is it reassuringly so? If there's one market which is saturated at the moment it is the iPod dock one. Not that there is anything wrong with choice, but there are so many cheap and cheerful devices around that a manufacturer needs to do things a little differently for their dock to stand out. One area of the market, though, which is still a little light is the high end. For years, the B&W Zeppelin has dominated the mid-range but there's little around that goes for premium shock and awe. Finally, with the launch of the Bang & Olufsen BeoSound 8, high-end audio manufacturers seemed to have accepted that most of us consume music now on the go and we need a device in the home which caters for our PMPs. 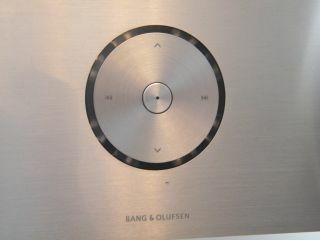 The Bang & Olufsen BeoSound 8 is a beautiful piece of kit. Its barbell-like shape makes you think the device should come with its very own strongman and its weight (4.25kg) confirms this. Not that you will be lifting it much as it does need to be connected to the mains for it to work. Wherever you put the BeoSound 8 in your house, though, the conical shape of the speaker means that it can sit nicely against a wall without destroying the sound. And the speakers have been created to adapt the sound to the shape of the room. Pumping out 70w for base and mid range and 35w on the treble level, the speakers have each been equipped with dual amps for optimum sound. Listening to some Alison Krauss on the system, the audio sound crisp and clear and there was real depth to her voice. The BeoSound 8 has been created with Apple products in mind. Because of this, the main docking station can house iPods, iPhones and even the iPad. We were shown a demo of the iPad on the system and we have to say that the burly machine looks right at home on the device. Although the BeoSound 8 isn't the first to offer iPad connectivity (the Arcam rCube does so through wireless connectivity) it is the first to look as if the iPad belongs with the device – a major coup. Although the speakers are what stand out on the BeoSound 8 (literally) there are a number of nice touches on the chassis. There's a little rest on the back of the device which can be used to support the iPad when it is docked and the circular touch panel on the front is a joy to use. You do want to swirl your fingers around it like a click-wheel, however, but the controls work fine apart from this niggle. The aluminium chassis adds a touch of class to proceedings and if you are not a fan of the white look of the speakers, the setup also comes in black. And that's pretty much it for features – the BeoVision is as minimalist as they come, with even the USB and Aux-in hidden from plain view. Interestingly, though, there are also customisable fascias to go with the BeoSound 8, ranging from pink to blue. This is something we would have expected to see from a much cheaper device but the colour options are welcomed. It seems odd to praise a company that has come to a saturated market late, but the BeoSound 8 is a majestic machine which oozes style. It may well have competition from the Bowers & Wilkins Zeppelin and the Arcam rCube, both of which are retailing for nearly half the £895 price tag of the BeoSound 8, but Bang & Olufsen first stab at this category may well also be the best. The BeoSound 8 has UK release date of 'end of November' and will be priced at £895.